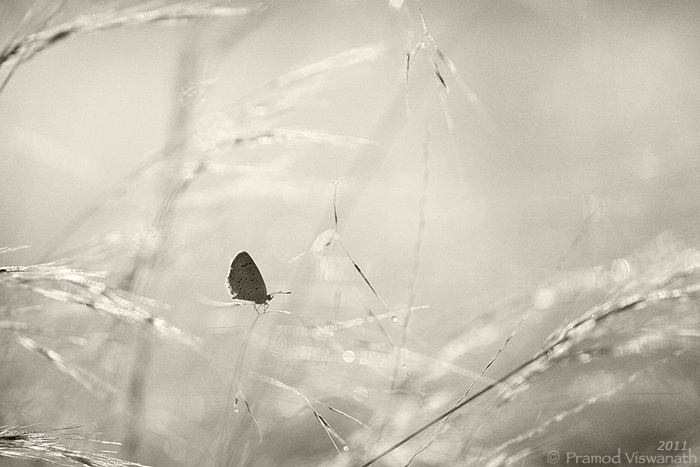 The Butterfly materialising out of a chaos of grass blades is awesome. I guess the colour treatment is what makes this image for me. Ganesh, how i love this Butterfly and grass series, so subtle and sophisticated, and that little hint of colour..there and not there... just so adds to it.. love this inimitable style of yours..brilliant. The other day i was trying to read something around art analysis and if a painting or photograph can be broken into sub elements. We need not agree with all elements mentioned here. We might even add more based on our personal definition of what art is. But I liked the idea that if we break down a painting or photograph into sub elements it might score high on some fronts and not so on other fronts. In that direction for me this image scores high on the "texture" front. I have been trying to understand of the images posted in CNP why some have a stronger appeal compared to others for me. Of the list of all elements mentioned in the link i realized i implicitly look for some of these elements in an image and their presence or absence defines whether the image appeals or not. For example texture,color and space holds a stronger appeal to me compared to others. For others it might differ i guess. To me, the textures, image tonality and many other attributes in your images remain in the realm of fantasy. Beautifully crafted image sir. I feel the dark strand at the top right corner to be slightly dominant. TFS. The question is, amongst all the grass that it finds, why only this? Why so close to the ground? Shows its humility & very nature of being grounded? Excellent image Ganesh. I loved the color version as I saw it in the camera too. Texture makes this image for me. Let me know when you print it on a matte paper, would love to see it! Coming back, it also reminded me of this > http://www.framesfromwild.com/home/wp-c ... _small.jpg under a different lighting conditions. Would love your thoughts on this. The simplicity of order in the midst of apparent chaos is something which I think is very appealing in this image...the oxymoron presence makes the duality grow in the mind... Truly an example of making something out of nothingness!! Mahesh, I think art may have some or all of those elements but converse is not true - that is something which has all these attributes need not be an art. I think there is another subjective attribute - being able to connect which can't be easily characterized. Pramod, a fine image there with a different joyous mood. Yet another i-will-leave-you-speechless-today image Ganesh Its taken me all day to come up with this silly comment, came back to this image so, so many times..
Its like a thin waft of paper, in grey and black.. Its fluttering in the wind and a butterfly mistakes the black for a reed of grass, settles down.. But its all going to vanish in the wind any moment now..
i'm speechless, ganesh .. all i can do is close my eyes 'n FEEL. one of your finest ever.